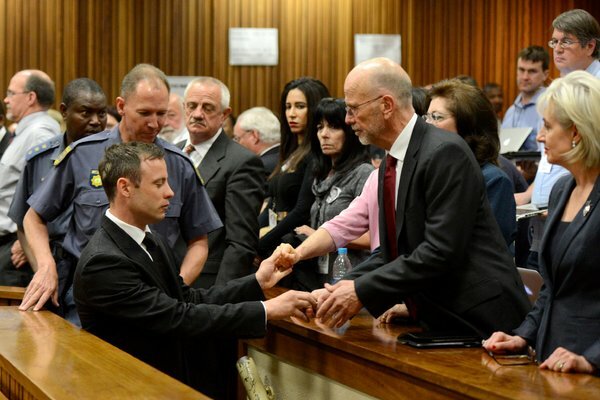 Oscar Pistorius'sentencing suggests he's a psychopath. Finally, the other shoe has dropped. And the judge has answered our question . . . sort of. The question asked several Pistorius blogs ago was, does Oscar have psychopathic tendencies like Lance Armstrong and OJ Simpson? Because I felt I knew less about Oscar than Lance and OJ and because a different culture and criminal justice system was at work, I decided to let the judge determine Oscar’s mental state. By sentencing Oscar to five years—much less than the ten years she might have—Judge Masipa found the 27 year old to enough of a threat for his probable psychopathic tendencies to keep him out of circulation. She’d found him guilty of culpable homicide back in September, but she acquitted him of more serious murder charges. The disabled athlete’s defense team had requested that he be placed under house arrest for three years and perform community service for his admitted killing of Reeva Steenkamp on Feb 29, 2013. Oscar spent nearly a million pounds for his defense team, according to some reports. There’s always the chance that they encouraged him to lie and shade the truth. If so, it would mitigate the “lying” tendency a psychopath like Oscar might have. Another mitigation regarding the psychopath label: one would expect a full-blown psychopath to appeal a prison verdict. Oscar didn’t. Family members said immediately after the sentencing that Oscar would not appeal the length of the sentence. Surprisingly, Ms. Steenkamp’s family said it was “satisfied” with the ruling,.“I’m just glad it’s over,” June Steenkamp, the victim’s mother, told reporters outside the courtroom. However, South African prosecutors said they would decide within 14 days whether to appeal the length of the prison term. It all may be moot, Oscar could eligible for house arrest after serving just a third of his time in prison . . . according to South African law.The athlete’s defense team said the law under which he was punished calls for him to serve only one-sixth of the prison term — 10 months — before he can be placed on house arrest. He was also given a suspended three-year term on separate firearms charges.But some South African legal experts said the conversion of prison time to house arrest was not automatic and required negotiations with the correctional authorities. After serving half the sentence, Mr. Pistorius can also apply for parole. Shortly after the sentence was handed down in Pretoria on Tuesday, the International Paralympic Committee said Oscar—popularly known as The Blade Runner— would not be permitted to paticipate in its competitions for the full five years his sentence.